Are you planning a big move with kids in the next few months? Moving can be stressful! It’s a significant change, after all. Proper preparation is the key. The sooner you start planning, the better. If you need help, read our five awesome tips for moving with kids right now. Keep your kids informed during the entire time you plan on moving into a new house. They need to be aware of what’s going on, no matter how young they are. Discuss the new and exciting adventures of selling the home and moving into a new space. Keep your explanations clear and simple too. Welcome their questions about the move. You may not have all the answers to their questions, but your child needs to know he can trust you. If you can start the moving process well in advance of the big day, you’ll save yourself the stress of last-minute prep. Start cleaning up and organizing your children’s rooms months before you move out of the house. You and the kids can determine what items to keep and what old toys can go. Then plan a weekend to have a garage sale. Schedule out when to pack up everything with your kids as they can help you after school on weeknights to accomplish the task of wrapping up items. Depending on the age of your children, consider letting them pack up their own special box filled with items that mean the most to them. It could be filled with favorite toys and games, important books, and memorable photos. Let them decorate their special box as well. When you get to your new house, make time to unpack that special box together in their new room. It will be a nice transition and an important bonding time. Another tip for moving with kids is to continue with the same routines. Does your family always stop for ice cream after church on Sundays? Or maybe Friday nights are popcorn and movie nights for your family. Don’t break these habits. These events need to stay consistent in your kids’ lives to make the changes go smoothly. Make moving to a new home as fun as possible by continuing to keep up with the things you all love to do together. Consistency can be reassuring for your kids, too. Moving with kids should be another bonding experience that you can all talk about years down the road. Explore their new neighborhood as a family. Is there a park close to your new home? Are the neighborhood kids excited to have new friends to play soccer with after school? Take the time to get to know your new neighborhood. This ensures that your kids will have a great time transitioning from one place to another. We hope our top five tips for moving with kids can give you advice on how to make this possibly intimidating experience go as smoothly as possible. 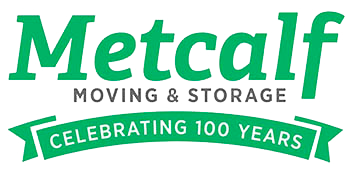 Our team at Metcalf Moving & Storage can help you move into your new home in no time. Contact us if you need a helping hand with your move!